Hybrid securities are investment instruments that combine the features of pure equities and pure bonds. These securities tend to offer a higher return than pure fixed income securitiesFixed Income SecuritiesFixed income securities are a type of debt instrument that provides returns in the form of regular, or fixed, interest payments and repayments of the principal when the security reaches maturity. These instruments are issued by governments, corporations, and other entities to finance their operations such as bonds but a lower return than pure variable income securities such as equities. They are considered riskier than pure variable income securities such as equities but less risky than pure fixed income securities. The return generated by a hybrid security can be divided into two components: The fixed income component (the bond part) and the variable income component (the equity part). Similar to most fixed income instruments, hybrid securities typically pay a certain proportion of the face valuePar ValuePar Value is the nominal or face value of a bond, or stock, or coupon as indicated on a bond or stock certificate. It is a static value determined at the time of issuance and unlike market value, it doesn’t fluctuate on a regular basis. of the security as a return in each time period (usually annually) until the security matures. At maturity, the value of hybrid securities usually depends on the price of some other underlying security or set of securities. Unlike bonds, which return their full face value at maturity, hybrid securities usually return an amount different from their initial face value. 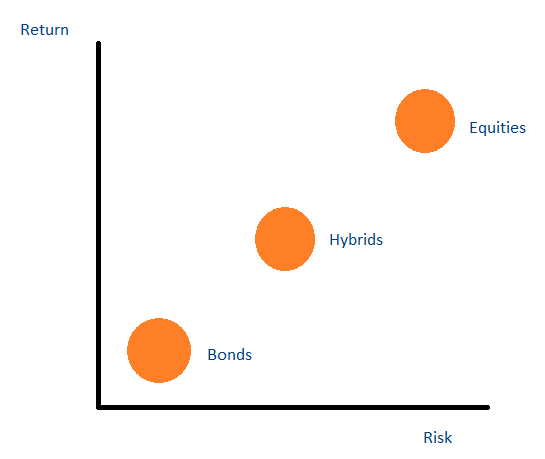 This is why hybrid securities are considered riskier than pure fixed income securities. Holders of preferred stocksPreferred SharesPreferred shares (preferred stock, preference shares) are the class of stock ownership in a corporation that has a priority claim on the company’s assets over common stock shares. The shares are more senior than common stock but are more junior relative to debt, such as bonds. receive dividends before the holders of common stocks. Also, the dividend received by the holders of preferred stocks is usually different from the dividend received by the holders of common stocks. Preferred stocks are considered safer than common stocks but less safe than bonds. In case the business faces solvency issues, the holders of preferred stocks are paid before the holders of common stocks. In addition, preferred stocks can sometimes be converted to common stocks at a premium (1 preferred stock for 2 common stocks). In-kind toggle notes are a form of hybrid security that allows cash-strapped companies to raise additional capital to meet short-term liquidity needs. An in-kind toggle note allows a company to pay interest in the form of additional debt. The company issuing the in-kind toggle note gives the holder of the note more debt in place of interest payment. In-kind toggle notes can be seen as an instrument to delay the payment of interest to debtholders. Convertible bonds are fixed income instruments with a call optionCall OptionA call option, commonly referred to as a "call," is a form of a derivatives contract that gives the call option buyer the right, but not the obligation, to buy a stock or other financial instrument at a specific price - the strike price of the option - within a specified time frame. on some equity. The convertible bonds issued by a company can be converted into a fixed number of stock shares of that company. In some special cases, a convertible bond issued by a company comes with a call option on the stocks of some other company. These special convertible bonds are known as exchangeable bonds. The interest rates on convertible bonds are usually lower than the interest rates on standard fixed income bonds. The interest rate differential is the “premium” convertible bondholders pay for the equity call option. Pessimist vs. Optimist InvestorsPessimist vs. Optimist InvestorsDifferentiating between pessimist vs. optimist investors is best done by using the phrase “a pessimist is an optimist with experience.” An optimist is hopeful and confident that things will turn out for the better. On the other hand, a pessimist always keeps in mind the possibility of the worst outcome.